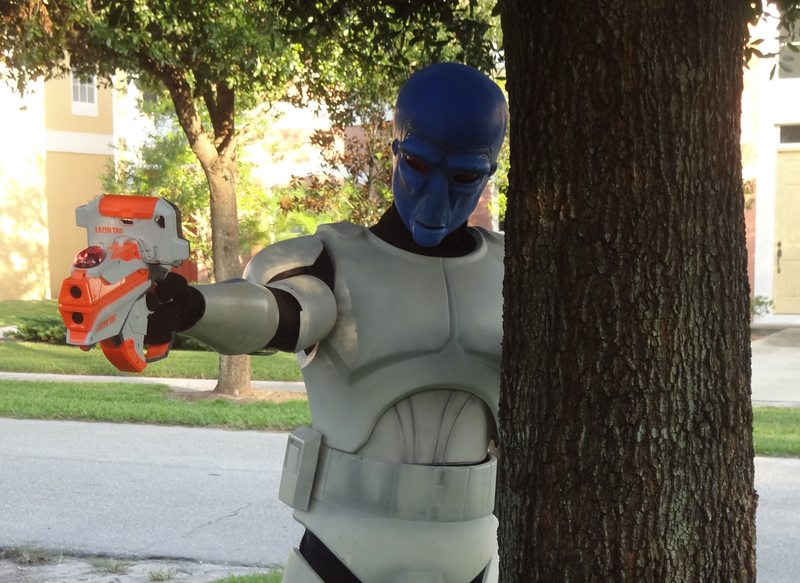 Hasbro has reinvented laser tag for the new generation; the Apple generation that is. I first learned about the system earlier this year and it looked promising. I’m happy to say that the fleshed out product is just as much fun as it was originally advertised. Compatible with the iPhone (3GS and up) and iPod (4th generation and up), this new laser tag is a ton of fun for the entire family. Since I’m an Apple junkie, I was thrilled to test this one out with my family after receiving the item for review. The basic kit comes with two blasters and, after installing the app on my devices (one iPhone 4s and one iPod 4th generation), I was all set to kick some tail. For practice and to get a handle on how to play the game, I played the boot camp lever in solo mode first. In solo mode, swarms of targets come at you from EVERY angle and you must hit them precisely on target, or you lose. The boot camp level was surprisingly nice at first and then it unleashed its evil side. As long as you have no major obstacles in your way (like pets, tables, wires, etc…), you can play this game indoors or outdoors. The gun has a firing range of 250 feet and you can play with up to 24 players. The gun uses your devices camera to show you an on-screen ‘Heads-up’ of your opponent and helps you keep track of your gear, hits and remaining power supply. The swarms appear to be on anything your camera can see (spouses, pets, children, etc…). This was a little weird for me at first, but I got use to it. I tried to play while sitting on my couch, but the gun didn’t like that so much. So, walking around my house, I shot swarm after swarm in my living room, kitchen and hallway. At first, my son couldn’t figure out what I was shooting at. It was funny when he got in my range and a swarm appeared on his shoulder and I had to shoot at him to get rid of it. He had no idea what I was doing, but he said I looked funny doing it. Once I had some practice in, I challenged my husband to a game. He hadn’t practiced with it yet, so I was sure I would win…I was wrong. He took to it like a pro and unlike me, he went behind our cars, trees and anything else he would fit behind. I lost within minutes. 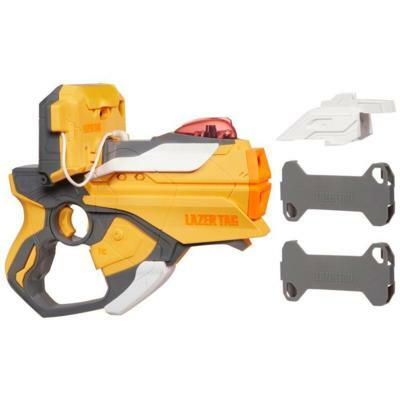 Coming from a family that has light saber fights on the front lawn at night, this game fit us to a T.
Nerf Lazer Tag is available at select Hasbro retailers as well as Amazon, and comes in either a one blaster pack or two blaster pack. Warnings…if you get motion sickness, this game is not for you! It’s also suggested that you take frequent breaks to avoid fatigue and strain.